Tonight, I got my swagga back! For the last few weeks I just haven’t felt like cooking or eating anything that I make. I needed something to jumpstart my passion for cooking. A leftover cheese platter and a quick trip to my college grocery store was just the trick! The dish is pretty simple – took about 25 minutes of active time – and will be perfect for any meal of the day. Much of the flavor depends on which cheeses you use, so get creative in the cheese aisle. Or, do what I did and make this next time a random assortment of (fresh) cheeses is headed for the garbage bin. Sautee onion with oil in a large, non-stick skillet (with an oven-proof handle) over medium heat until softened. Add sausage and break into small pieces with a wooden spoon. Sautee until browned then stir in bell pepper. Meanwhile, in a shallow skillet, heat hot water until boiling and add broccoli. Steam with a covered on for 2 minutes, or until broccoli is bright green and still firm. Drain into a colander. In a large bowl, whisk eggs with heavy cream and oregano. 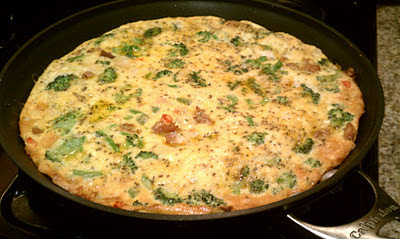 Add broccoli and cheese to skillet. Pour in egg mixture. Push down broccoli to submerge and coat in egg mixture (no one likes charred broccoli!). Bake for 20-30 minutes, or until the eggs are set and firm. Thanks! If you make it, let me know how it turns out.